Click Here to see full Auction Listing! 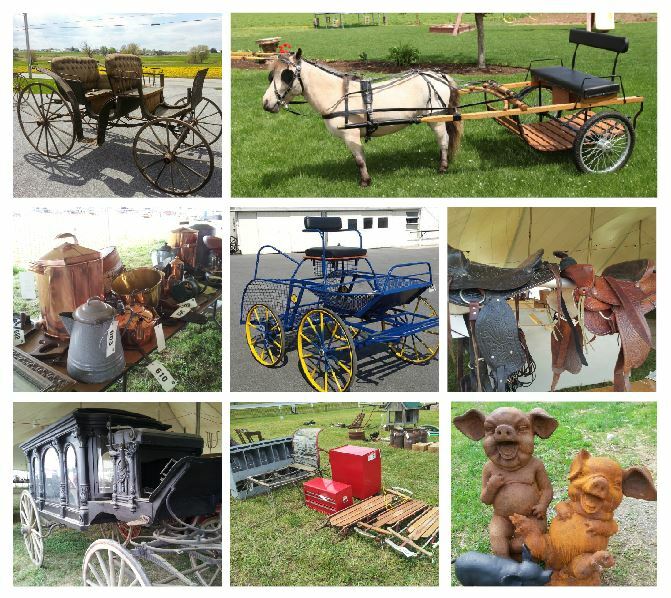 About the Auction – The Lancaster County Carriage & Antique Auction is a premier event that takes place annually on the Thursday & Friday before the last Saturday in June. There is an Early Bird Auction on Thursday afternoon and an all day auction on Friday. Thousands of people come to the village of Bird-in-Hand for the auction which is held on the Smucker Homestead. Equine and antique enthusiasts, consignors, local residents, out-of-town visitors, and whole families look forward to our auction each year. Many are from the East Coast, but also from places as far away as Texas and California. This is a significant fundraiser for our Hand-in-Hand Fire Company. We are appreciative of the amazing support we receive both from our local volunteers and the visitors to our area who come back year after year. Our auction is known for its fine carriages; great selection of miniature horses; and harness, tack, and carriage appointments. It also offers one-of-a-kind antiques, furniture, and high-quality quilts and crafts. An attractive part of the auction is the sale of annuals, perennials, roses, flowering shrubs and bushes, shrubbery, ornamental grasses, and trees. A team of auctioneers is busy taking bids under several tents and in the field. The food tent is a highlight for auction goers as they take breaks from the hustle and bustle of the bidding. The delicious food is very popular since much of it is prepared fresh on the auction grounds. Our breakfast, lunch, and dinner menus are family-friendly. From sandwiches and fries for those who prefer grab-n-go food to nutritious meals for the auction attendees who are spending the whole day, there is something for everyone. The fresh fruit, locally made pies and doughnuts, and homemade ice cream are perfect summer treats. The auction is a place where people are drawn together for a common cause. Here they can enjoy the horse-drawn shuttle wagon, the rows and rows of antiques, the large variety of specialty carriages, and the excitement of bidding. Many have brought items to sell, others have come to buy, and still others are part of the large network of volunteers who make the sale possible. Everyone, including passersby, gets caught up in the community spirit. At the end of a fun day, buyers have the satisfaction of knowing they have supported quality firefighting in our community. Vision – The vision of the auction is to provide a good, clean market for both consignors and buyers, raise funds for the Fire Company, and create a community event bringing all kinds of people together. Our wish is that the auction will maintain high standards and continue to offer quality merchandise. Our goals are to continually strive to be fair and ethical and grow the auction by attracting both buyers and sellers. We are excited that it has turned into a destination for many travelers who find it to be an enjoyable day. It is pleasing to us when many satisfied people leave the grounds with their pickup trucks and trailers full of quality purchases when the auction is over. History – The Lancaster County Carriage and Antique Auction began in July of 2000 when Weavertown Coach Shop hosted the National Carriage Makers’ Reunion in Bird-in-Hand. Jake King and Elam Petersheim, a local antique dealer wanted to clean out the corners around their shops and barns where extra items had accumulated. With potential buyers coming to the area for the reunion, Elam and Jake scheduled a small sale on the day before the get-together. The news of the auction spread by word-of-mouth and 60 other people brought consignment items. It was a successful day and a fun addition to the reunion. Those who attended the sale encouraged Elam Petersheim, Jake King, and Paul Stoltzfus of Leola Coach, to make the auction an annual event. For seven years the auction was held at Elam Petersheim’s farm on Belmont Road east of Gordonville. The auction grew steadily every year. In 2008, the sale moved to the village of Bird-in-Hand on land made available by the Smucker family. Proceeds now benefit the Bird-in-Hand Fire Company. The sale has remained a quality auction with over one hundred carriages sold on consignment as well as quilts, collectibles, antiques, tools, plants and other quality merchandise. The response has been so overwhelming that in 2013 the Thursday afternoon and evening Early Bird Auction was added since there were too many items to sell on Friday alone.